Higginson I, Evans C, Grande G, Preston N, Morgan M, McCrone P, et al. Evaluating complex interventions in end of life care: the MORECare statement on good practice generated by a synthesis of transparent expert consultations and systematic reviews. BMC Med. 2014;11(111). https://doi.org/10.1186/741-7015-11-111. Walshe C, Algorta GP, Dodd S, Hill M, Ockenden N, Payne S. Protocol for the end-of-life social action study (ELSA): a randomised wait-list controlled trial and embedded qualitative case study evaluation assessing the causal impact of social action befriending services on end of life experience. BMC Palliat Care. 2016a; 15:60. https://doi.org/10.1186/s12904-016-0134-3. 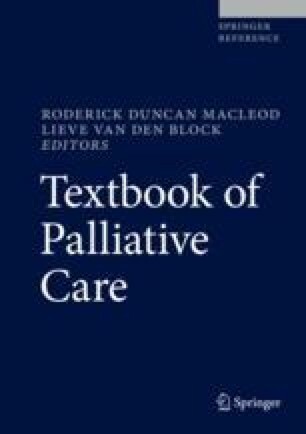 Zweers D, de Graaf E, Teunissen S. Suitable support for anxious hospice patients: what do nurses ‘know’, ‘do’ and ‘need’? An explanatory mixed method study. BMJ Supportive & Palliative CarePublished Online First: 30 June 2017. https://doi.org/10.1136/bmjspcare-2016-001187.